Myanmar residents stand near the Chinese-owned Fu Yuen Garment Company Ltd. factory after armed thugs attacked and hospitalized some workers on strike, on the outskirts of Yangon, Oct. 15, 2018. More than 100 Myanmar garment workers are continuing a strike on Wednesday in front of Maha Bandula Park in downtown Yangon, demanding that a Chinese-owned textile factory rehire 30 workers responsible for starting the labor action and punish those responsible for a violent attack on striking workers on Monday that injured 25 people. They also called on officials to enact laws to protect workers in Myanmar. Workers from the Fu Yuen Garment Company Ltd. in Yangon’s Dagon Seikkan township have been on strike since Aug. 21 demanding better work conditions and an end to mistreatment by factory owners. After the 30 members of a committee that had been campaigning for better conditions for workers were sacked, others set up a protest camp outside the factory. On Monday, the striking workers clashed with thugs hired by the factory, who attacked them with iron bars, leaving 25 laborers injured. Following the violent clash, neighborhood residents demanded that police take action against those who beat the striking workers. After police told them to file complaints so they could arrest the assailants, the locals got into a fight with people still working at the factory, and authorities arrested two student union leaders on Wednesday. RFA's Myanmar Service was unable to reach the relevant police station and Fu Yuen’s management during several phone calls. Authorities issued false information that striking workers sustained injuries in a clash with those still on the job, instead of publicly acknowledging that they were beaten by thugs hired by factory owners, said Thet Htar Swe, chairwoman of the Fu Yuen factory union, who was among the striking employees. “Everybody knows who’s right and who’s wrong,” she said, adding that the problem needs to be resolved as soon as possible. Activist Myat Kyaw, who is helping the striking workers, said some suspect that police collaborated with the factory’s owner in making a plan to crack down on the workers’ protest. “We would like to request that authorities implement a plan to resolve this problem,” he said. Yangon regional lawmaker Nyi Nyi said that the police and other administrative organizations are responsible for delivering justice in this situation. “They also need to be transparent and release information, which is why there has been a delay in resolving the dispute between Fu Yuen and its workers,” he said. “The factory is wrong, and the tension between the factory and workers is getting worse,” said Mya Sein, a lower house lawmaker representing Dagon Seikkan township. On Tuesday, plainclothes police officers arrested two student activists who were part of a group from the Basic Education Student Union and the All Burma Federation of Student Unions protesting outside Dagon Shopping Center in Yangon in support of the striking factory workers. Hnin Aung, one of the arrested activists, told RFA that officer Win Naing plans to file a case against him and fellow protester Wai Yan Oo for violating Article 19 of the Peaceful Assembly and Peaceful Procession Law, which allows public demonstrations only if organizers first obtain permission from local authorities. Police released both activists on bail Tuesday night. “We staged a protest questioning whether authorities were ignoring the attack on the workers by a group of thugs hired by the owner,” Hnin Aung said. “They told us that we will be contacted later to undergo the legal process,” he said. RFA could not reach the San Chanung township police station where the two activists were taken. 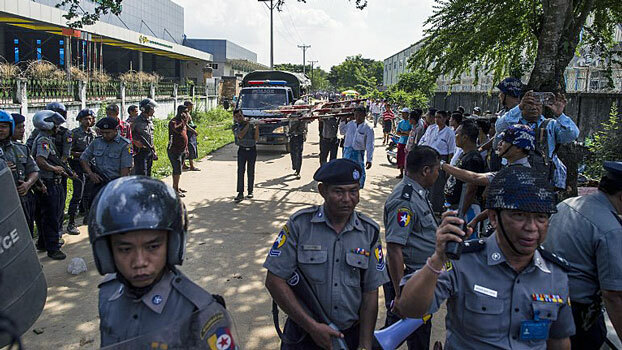 Two dozen of the workers injured during Monday’s clash between workers and the hired thugs were discharged from the hospital on Wednesday, Thet Htar Swe said. The injured workers have filed a case against the attackers at Dagon Port police station, she said. The case is pending until medical reports have been received. RFA could not reach the Dagon Port township police station or Fu Yuen factory management for comment. On Monday, thugs believed to be hired by factory owners and other employees still working at the plant destroyed the protest camp and beat dozens of workers as they demanded the reinstatement of the 30 fired employees. Those injured were taken to Sanpya Hospital, said injured factory worker Aye Thet Moe. Zayar Phyo, a union member of the MCE Rainbow Soup Factory who sent the injured workers to the hospital, told RFA that more than 20 workers were being treated at the medical facility for injuries to their heads, legs, hands, and other parts of their bodies and for broken bones. As protesters blocked both of the two entrances to the factory, supervisors and assailants created a small entryway along the factory’s rear wall for non-striking employees and the thugs to access the building, he said. “We, the protesting workers, blocked this door because the protest has gone on for months, and the workers are tired,” he said. But assailants wielding iron pipes and wooden sticks beat workers, most of whom were women, who blocked the entryway. Aung Htay Win, deputy director general of the Labor Department, said that the clash occurred when the striking workers blocked the rear entrance to the factory that about 1,000 employees still on the job are using to access the plant. “Workers who want to protest can protest, but they should let the others who don’t want to protest work,” he said. He said he could not confirm that hired thugs had beat striking workers because he hadn't seen the attacks, though they were reported on the news. Kyaw Htwe, chairman of the Local and International Labor Committee of Myanmar’s upper house of parliament, said his chamber in June approved changes to the country’s current labor law for disputes between workers and business owners, and sent them to lower house lawmakers for comment. The changes include points on how to prevent disputes and how to take action against those who violate rules or regulations, he said. “The upper house will issue a final approval when we receive the changes back from the Union parliament with the comments,” Kyaw Htwe said, adding that he could not comment on the Fu Yuen factory incident because lawmakers have yet to approve the legislation. Myanmar's labor law was enacted in 2012 and amended in October 2014 after workers' groups said that factory employers routinely violated labor rules with impunity or were only made to pay fines when found guilty of violations. They demanded that imprisonment be added to the penalties. The current draft amendment adds jail sentences of one to three months for violations and increases the fine to 10 million kyats (U.S. $6,223) from 1 million kyats (U.S. $623). Myanmar’s garment sector jobs are facing a threat as the European Union mulls the reinstatement of economic sanctions over the Rohingya crisis that would end the industry’s tariff-free access to the bloc. By Aung Theinkha, Khet Mar, and Nadar Chann for RFA’s Myanmar Service. Translated by Khet Mar and Nandar Chann. Written in English by Roseanne Gerin.